Hey readers! My name is Kristin and I am thrilled to be writing with Susan today. Let me introduce myself… I am a writer for Marie Callender’s Meals and other ConAgra brands. I currently live in Chicago with my fluffy Bichon Frise, Joey. I challenge myself on the weekends by trying new recipes—about a 90% success rate—and my favorite dishes include poached eggs in the morning, throw-whatever-is-in-the-fridge salads for lunch, and vegetable-heavy stir fries for dinner. I am always on the hunt for unexpected yet delicious food combinations! With fall around the corner, it’s time to bust out sweaters and riding boots to beat the chilly temperatures. Besides watching the leaves change color and sipping on pumpkin spiced lattes, eating warm bowls of soup on nippy days is one thing I am looking forward to this upcoming season. 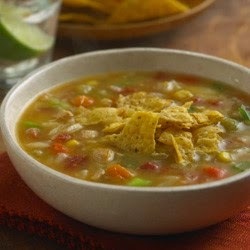 This recipe makes 4 servings, making it a perfect soup before a southwest-style dinner. If you have leftovers, pour the soup into a thermos for lunch and pack the toppings separately. Enjoy this zesty, easy-to-make soup! In a medium pot, heat vegetable oil over medium-low heat. Add chopped onions until softened. Add diced jalapenos. Pour in the rest of the ingredients except Monterrey cheese, avocado slices and tortilla chips. Bring to a boil over medium-high heat. Reduce heat to medium and simmer for 5 minutes while stirring occasionally. Top soup with tortilla chips, avocado slice and Monterrey cheese just before serving. Enjoy!